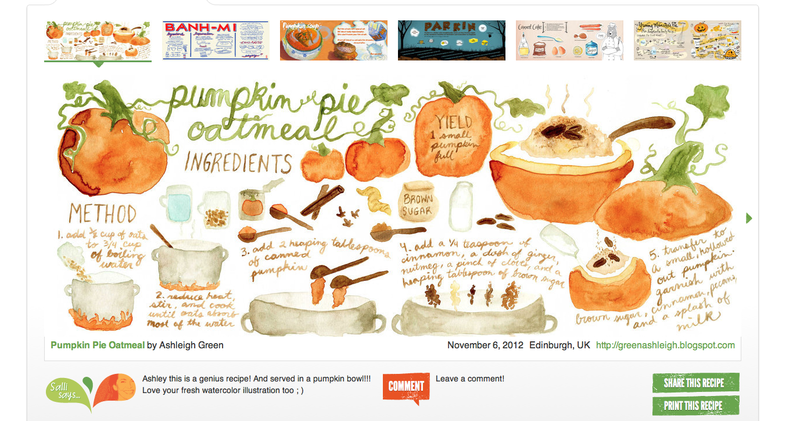 After discovering the super cool website They Draw & Cook I knew I had to illustrate and submit this recipe for pumpkin pie oatmeal I've invented here in Edinburgh. I literally submitted this illustration about 10 minutes ago and it's already up on their site! This is so exciting! Check it out on the actual site! The dish tastes great, and the process was so much fun to illustrate! I definitely want to do some more. Anyone have any recipes that are somewhat their own that they wouldn't mind letting me illustrate and submit to this site? Aw sweet, it looks so good on that website! Did you say in class that the page had gone wobbly because of the watercolour? You can always stretch your paper beforehand to stop that happening. Thanks, Holly! Yeah, it's still quite warped but when I scanned it in I just squashed everything down with a few fat books, which worked really well. Can you stretch paper that's not specifically watercolour? This paper is actually just a thick paper for drawing, pen & ink, etc.